With Orderhive’s Inventory Management software cut the guesswork and accurately track incoming and outgoing inventory levels. Know what sells and what does not, and practically never reach low-stock, no-stock or over-stock situations. Take smart purchasing decisions using real-time insights. View, manage and synchronize your entire inventory across all sales channels, warehouses, 3PLs, dropshippers, and FBA distribution centers from a unified and single-view platform. Keep your online inventory in tandem with the offline. Cut down inventory storage and carrying costs, and make your inventory move faster off the shelves, eliminating any little scope of spoilage. Just-in-time stock management helps you rightly determine and track stock across the supply-chain. Save both, the time and effort needed to manage inventory manually. With a collaborative and automated software in action, avoid unnecessary back-and-forth run and tracking errors, but rather have inventory data regularly updated on your devices. Can I bulk add / update / delete the products in Orderhive? Yes, Orderhive’s inventory management software provides different yet related functionalities to add & update products in bulk using ‘import’ feature, while delete products in bulk from the product page itself. I have same products under different names or SKUs in different channels. Is it possible to maintain same stock level for each? Yes, you can link products in the Orderhive inventory management software – i.e. linking two or more products together to maintain similar inventory levels centrally. It is advised to have similar SKU for a product across all channels, if not the same. However, SKU can be different due to reasons like a manual error or need of creating different SKU for easy channel-wise identification. Also, some platforms don’t have product SKU as a required field. In that case, you can link products after they are synced from your channels in Orderhive. On platforms like eBay where multiple listings have similar SKUs, you can link such products here in Orderhive to maintain a common inventory for all of them. Please note that once products are linked, Orderhive will ensure that similar stock level is maintained for linked products whenever a new order comes in or when you manually change the stock count, while other product details are not linked or considered as same. You can also unlink products when needed. Does Orderhive give alert notifications about low inventory level? Orderhive inventory management software shows summary of total in-stock, low stock and out-of-stock products on dashboard itself. You can also see the low stock items highlighted in red on Products page as well. Does Orderhive handle expiry dates, batches and lot numbers? Yes, Orderhive inventory management software enables you to track your inventory based on Location, Batch & Costs. You can add each of these parameters in Orderhive, and assign them to products to be able to process orders and returns using LBC. Yes, stock transfer is possible at every stage using Orderhive inventory management software – right from the purchase stage itself. You can simply ‘add/create a stock transfer’ for one or more products in bulk from the Product dashboard or for any PO from the Purchase dashboard. Kitting / bundling / assembling / composite products are supported in Orderhive? Yes, Orderhive’s inventory management software lets you add simple, configurable as well bundled products individually or in bulk and manage stock for all product types accordingly. You can also convert simple product into bundle whenever needed. Can I generate SKU using Orderhive? No, you can add SKU which was not created using Orderhive. I duplicated SKUs for two different products. Can Orderhive help? Yes, you can resolve duplicate SKUs in Orderhive inventory management software. Orderhive lets you sync duplicate SKUs from the channel or store which you can then resolve from within Orderhive. And this SKU change from Orderhive will get updated on the respective channels if they permit. Its highly recommended to resolve the duplicate SKUs beforehand. Does Orderhive support barcode scanning? Yes, with Orderhive’s inventory management software, you can generate and assign a barcode label to each of your products, and simply scan it to track its movement. Orderhive is compatible with any USB or Bluetooth barcode scanner that supports EAN, UPC, QR, or Code-128 barcodes. You can check here how to assign barcodes to products and act upon them across different stages of inventory. Does Orderhive have a Kanban inventory technique? 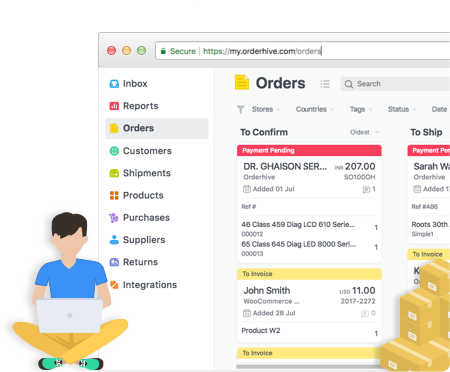 Orderhive inventory management software new version is based on Kanban approach – which lets you undertake various order fulfillment processes in a streamlined way – taking one order or process at a time. This lets you and your team to know where and when to put resources to stay most efficient. If I change the quantity or price of a product from Orderhive, will the updated value get reflected across all the marketplaces/ platforms (Amazon, eBay, Walmart, Wayfair, Etsy, etc) that I’ve integrated with Orderhive inventory management software? How much time does it take to update stock from Orderhive inventory management software to various integrated channels? All the updation of stocks happens in real time. It hardly takes a few seconds to get updated. Can I set inventory threshold level for all my products in Orderhive inventory management software? Can I fetch removed inventory into the system back? Yes, Orderhive’s inventory management software is laden with an easy functionality which allows you to archive or unarchive products from the list at any given point of time. Check how. Does Orderhive help in physical inventory count? Orderhive’s inventory management software makes physical stock count and warehouse inventory verification extremely easy with Stock Count feature. Orderhive is a user-friendly, fast inventory management software. It shows real-time data about your inventory status. With Orderhive, every piece of your inventory will be accounted for. It will also track your goods from the moment an order is received, its journey through the supply chain until it leaves the warehouse for shipping. What are the Pricing plans in Orderhive? Orderhive offers multiple pricing plans that you can choose from, according to your organization’s requirements and budget. You can also opt for Orderhive Plus to get customized workflows and processes. Does Orderhive offer a trial? Yes. Orderhive offers a 15-day free trial for all newcomers. All you have to do is sign up, create your Orderhive account and you’re ready to go. Why is Orderhive a great choice for businesses of all size and scale? A smart eCommerce Inventory Management Software takes resolves all of the merchant’s problems such as overstocking, understocking, manual data entry, inaccurate inventory count and others. By utilizing Orderhive, you can tackle all these issues as Orderhive connects all sales platforms together. This allows them to keep track of all the orders coming into their store through their e-commerce platforms (i.e. : Amazon, Shopify, Magento, and etc), the inventory across their warehouses, as well as what items are being shipped out – all in real-time. Orderhive Plus, our customized version provides tailored workflows and processes according to the needs of any type of business.